This topic contains 168 replies, has 41 voices, and was last updated by Kasai 4 months, 1 week ago. I had a previous topic for this texture pack but it was getting too long (I think anyway), so this is the new one. I’ll post updates on the texture pack progress with images, along with the occasional question to see what you guys think, and the download links for said texture pack when they are ready. Feel free to give suggestions if you think something about a texture looks odd and I’ll check it out! If you are new to this texture pack, and for some reason want older versions, their links are posted on the old topic entitled ‘New Texture Pack’. 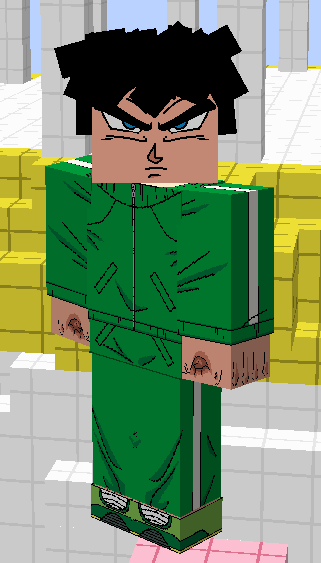 My first suggestion to myself is to fix the eyes on the Goten above. it’s amazing can’t wait for you to finish arcosians 😀 but can you put the recent download link? 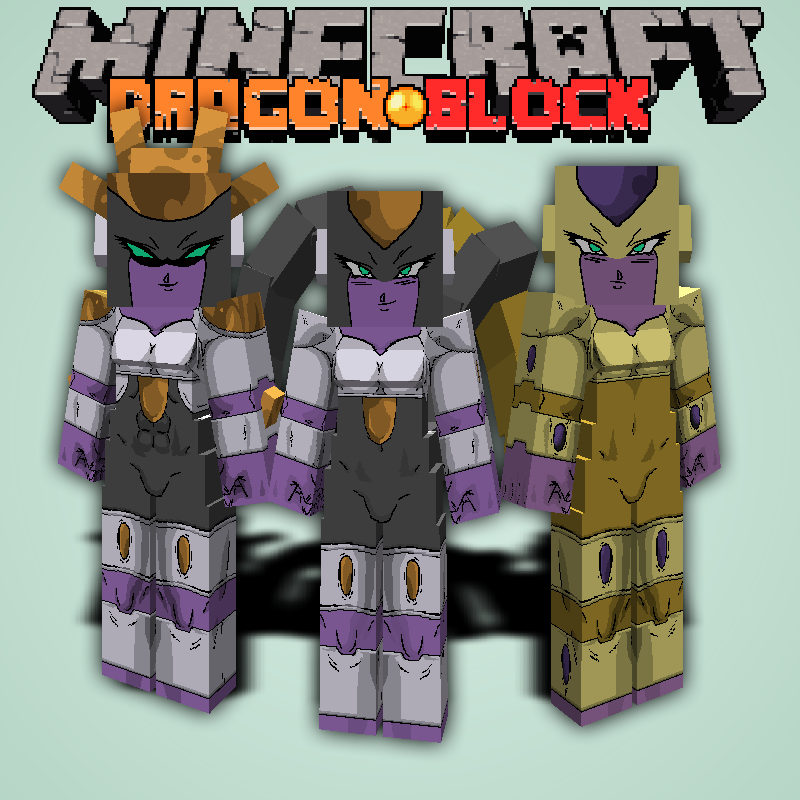 Ok, after my favorite HD DBC Texture pack decided not to update, I figured I’d find a new one. Welp…. I can Stop Looking. THIS IS SO COOL! Now, all I can do is hope this continues to be updated…. de alguna forma podrías colocar las “lineas” debajo de los ojos del super saiyan 4? No, no puedo, por lo que yo sé. La transformación solo cambia el color de ojos de la cara. Además, las capas de la cara no me permiten agregar las líneas rojas debajo de sus ojos. ¡Es una buena idea! Para que yo haga esto, Jin debería agregar un espacio adicional para la capa facial y el tipo de ojo. Si alguien lee esto y descubre que estoy equivocado y se puede hacer, ¡por favor dígame! 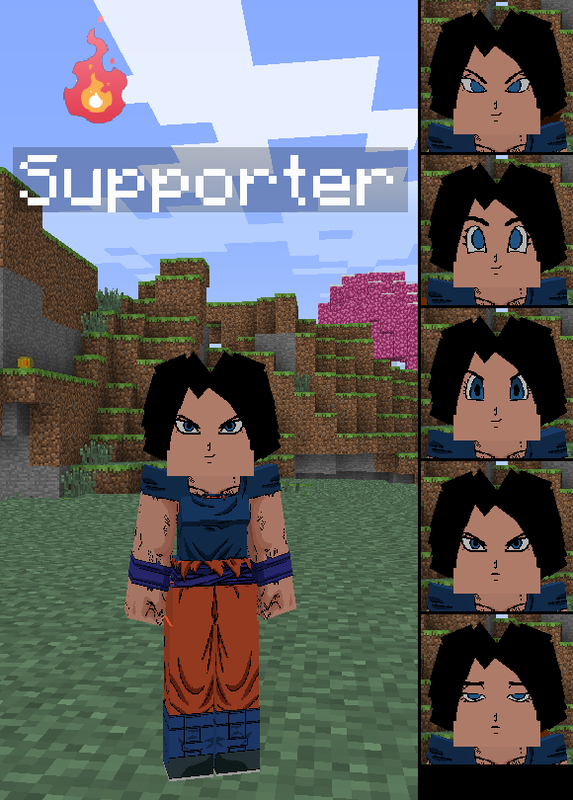 Alright, gonna have to say this right now; I think the pack looks wonderful, and while I don’t intend to on using it for the simple fact that the Dragon Ball Z style textures draw me out of the game, as the style clashes with minecraft, I would recommend it for anyone looking for this style of textures, just based on the screenshots alone. You’ve given the Oozaru and Golden Oozaru forms a muscular design, a bit too much of one. I do know that they did have some muscles, however I don’t recall them being that… toned. Maybe it’s just me, but it looks a bit off putting. Other than that, the rest is stunning. This reply was modified 1 year, 3 months ago by NegativeBoom. I completely agree that the Oozaru is too toned, I’ve already removed the abs, and I’ll tone down the legs and arms hopefully before the next release! Thanks! I also agree that this style does clash with minecraft, so I have toned it down just a little bit. Normally I would draw these images to greater detail with more levels of shading and less pixel like. Thanks for the feed back! Well i don’t want to be rude but this nose it’s not so beautiful after all… maybe you should edit it ? Also Negative Boom is right… the oozaru has too much muscles.. In order the texture is good ! Keep up good working ! The nose is an option, so in character creation you could choose a different one, including the one you prefer above. I’ll fix up the pixel gap with that mouth though! Thanks! Official site for update logs and downloads wen ? 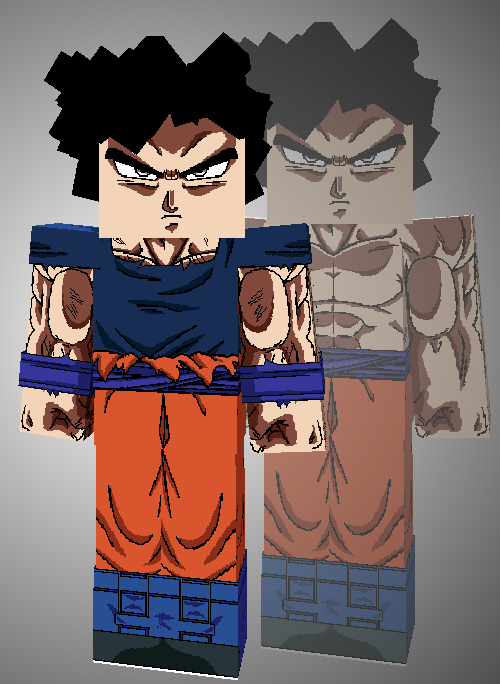 I’ll release the new version once I’ve done all of the Dragon ball super outfits. I don’t know how long that will be. Probably about a week? Maybe less? The arcosian texture looks awesome ! How you make the texture? This is my first texture pack ever. I learnt how to do it with youtube videos. How I make textures? I use paint.net to make these textures because its the only thing I know how to use. I know how to make DBZ/Super pictures because I draw them in my spare time. I just pixelize and simplify it for minecraft. This reply was modified 1 year, 3 months ago by Kasai. Out of curiosity, do you use a drawing tablet, and if so, what do you recommend? I happen to be in the market for one, and I was hoping to ask someone who knows a little more than I do. Sorry but I can’t help. I don’t use a drawing tablet. I’ve added shading to some noses and mouths. 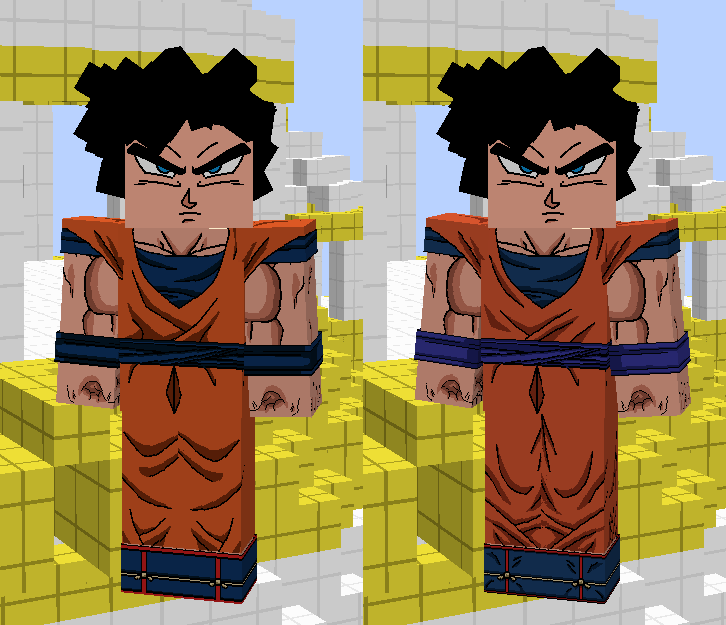 Also, I re-textured the Goku Gi because the old one looked really bad and it was really starting to annoy me. It’s not a joke. I’ve done 7 out of the 11 dragon ball super related costumes. I think you misunderstood. I know. I read it all before posting. I just thought it was kinda funny. Just a 7/11… Ah, forget it. But yes, I know what you meant. This reply was modified 1 year, 3 months ago by Taku. 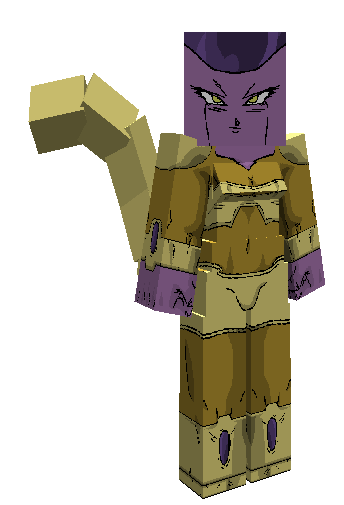 I have been busy as of late and thus have not done all that I have wished – only 8/11 of the DB Super costumes have been completed. I’m still busy now, so I’m going to post this download link, which is the newest version. I’ll get back to it eventually, but in the meantime, this is what I got! Enjoy! 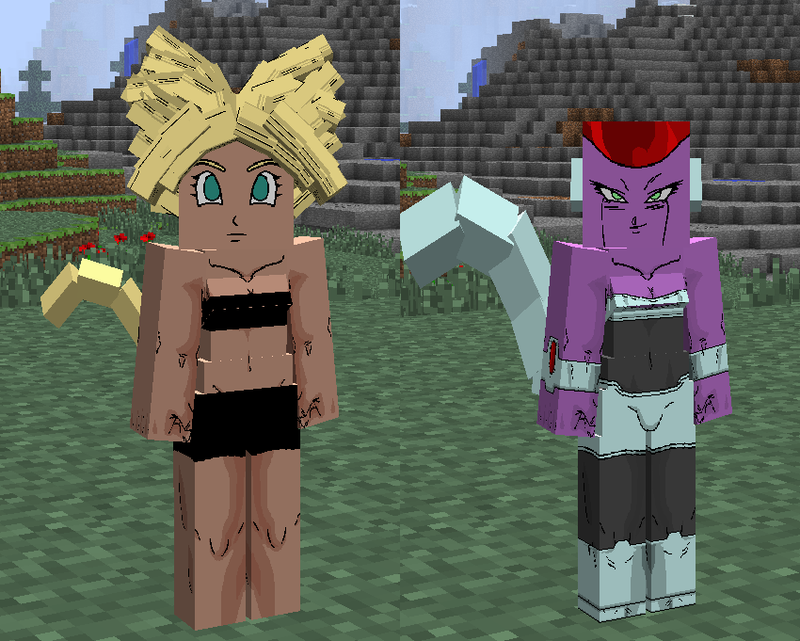 Where do you keep those hair textures in the texture pack? Is it okay if I modify the texture pack for my use only? Trying to make the Hair Texture Better, here are some of my attempts. 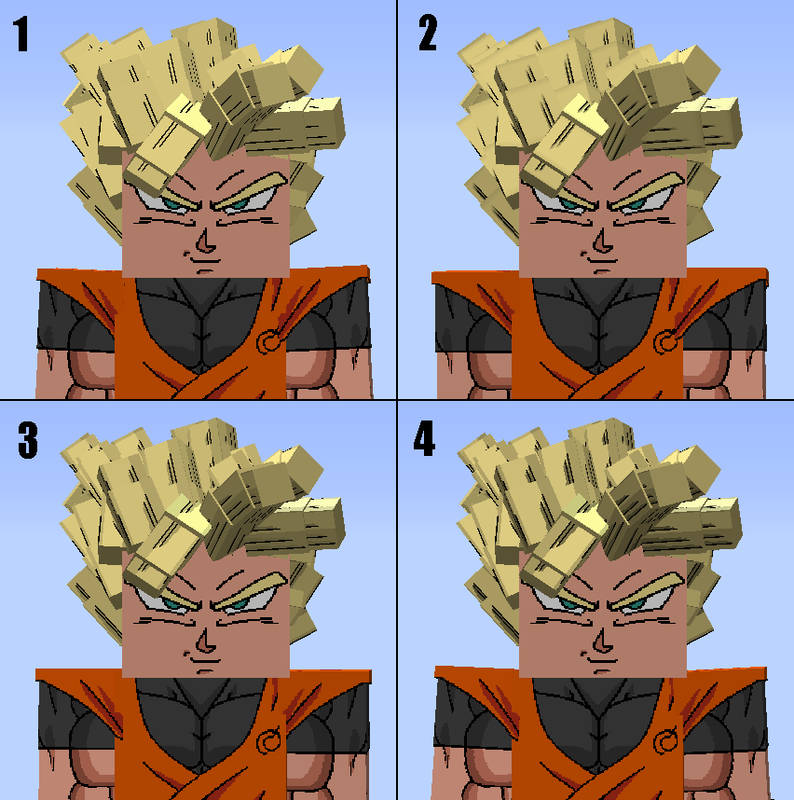 Tell which one you like, and if you don’t like any of them, then please leave a suggestion on what you think I could do to improve it. 3 and 4 are the best. 4 it is. It’ll be that next release then! What do you guys want the most for the next release? I plan to do pretty much everything DBC related, but what do you guys want sooner rather than later? 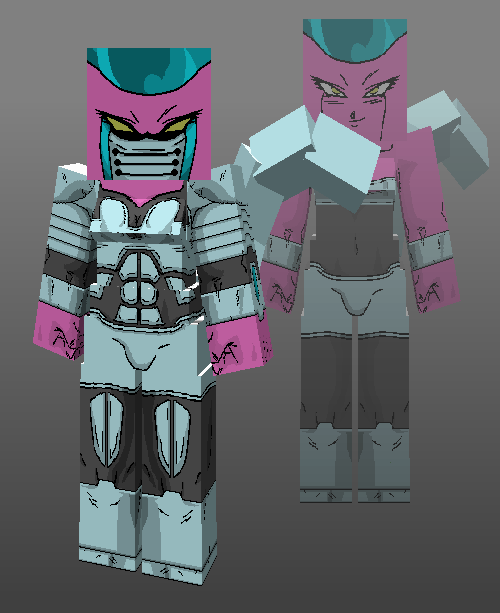 So far all I’ve done is some NPC skins and a bunch of costume fix ups – no major changes, just fixing some things. Also, is it possible to make a poll for these questions so that we don’t have numerous messages piling up here? 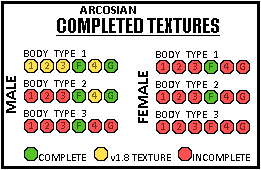 Arcosian Body type 3 would be nice to update. 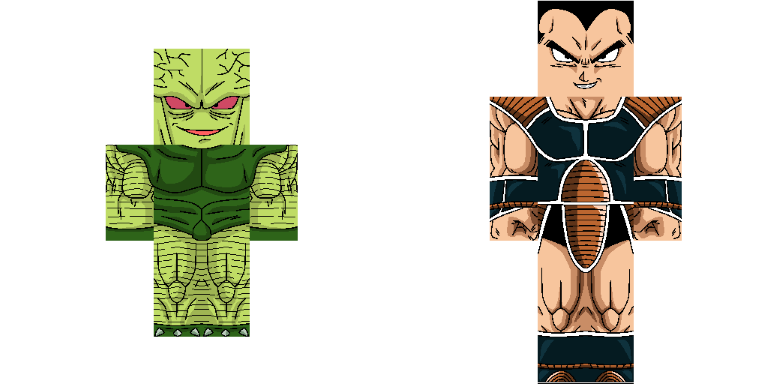 Namekians getting a texture would be appreciated. Thanks, I completely missed that shoulder thing, although it makes sense now that I think about it. I’ll alter it to be similar to the image you linked, thanks! Final Human Body Texture Adjustments!!! This will be the last time I alter the Human body texture for quite a while. I have an image below comparing the current texture with a new one that I’m working on from scratch. Tell me which one you prefer! I like the new one (2) better, but I also think it (2) might have a bit too much detail. Tell me what you think! You are amazing! Please stay working. Okay then, 2 it is. I thought that it might have been a bit too much, but it turns out that’s fine with you guys! I’ll finish the skin and it’ll be ready for the next release. 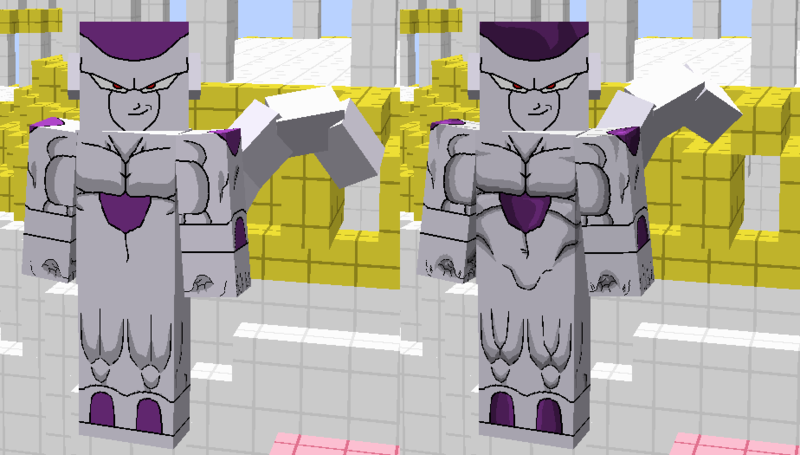 The new muscle design will also be transferred to Aracosians, Great Apes and the SSJ4 textures. Also Nemekians when I get around to doing them. 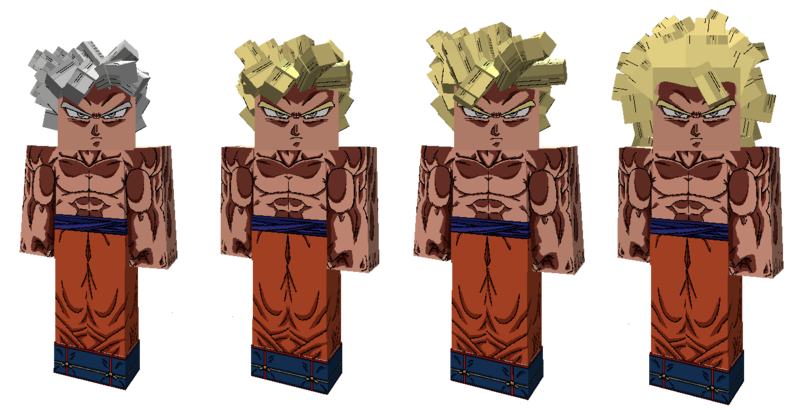 Also, do you guys want the face textures that are on the NPC Goku and Gohan textures available for players? Or keep them exclusive to the NPC’s? I would prefer to keep them exclusive, it makes the NPC’s more unique, but if you guys really want them, then I’ll put them in for player characters too! Seeing as I’d be outruled by the 87 people who voted for 2, but I think the texture for it is too muscle-y. If you wouldn’t mind, it’d be cool if you made a less buff looking one for them too, maybe a second pack link just for it? Hopefully Jin will add the ability for Human / Saiyan / Half-Saiyan Races to have multiple body types. That way we can have different builds. 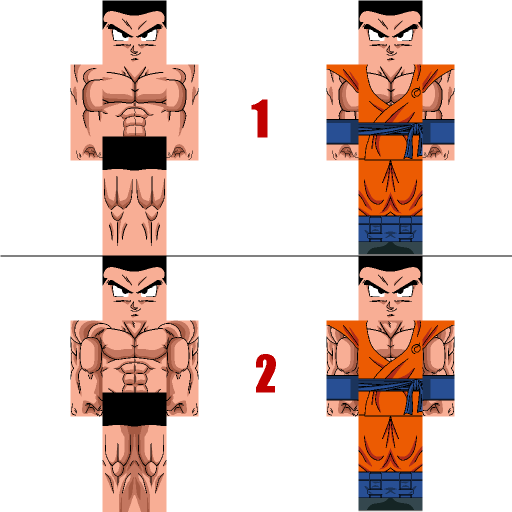 Like body type 1 would be Gohan Res F’, body type 2 could be Half way between ripped and scrawny, and body type three can be what I have above. … Actually, I’m going to put this in the suggestions section of the forums right now. 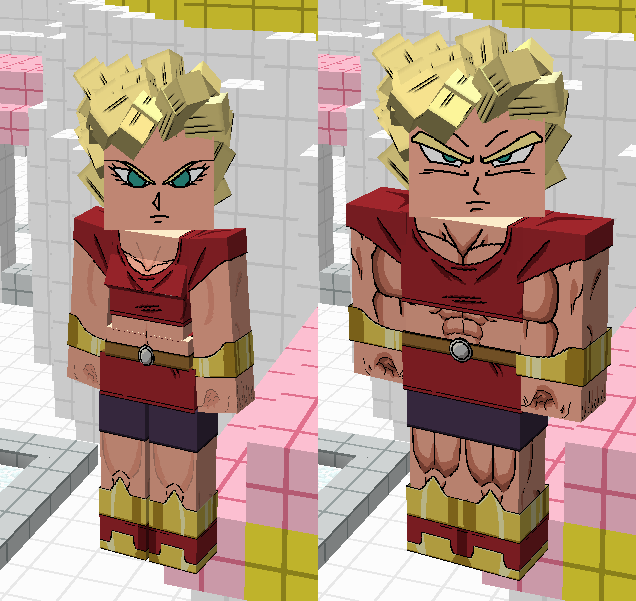 Until more Human body types become a thing, I’ll create some Texture pack add-ons that give you a different build (Like my custom hair texture pack, except with special textures, not just a template). Sadly, this will also change how you see every other player too. Not NPC’s though. I’ll make some and release them with my next texture pack release. I can’t put the red bands on just one side of raditz :(. So he gets none. Yes, I know. That’s because Aracosians are not done yet. Above this, in a previous post, you will see an image that shows that I have both my texture pack and Jin’s texture pack enabled at the same time. Try doing this yourself and it may resolve some issues until I finish Aracosians. Did you ever get around to finishing the Goten type eyes? No, not yet. 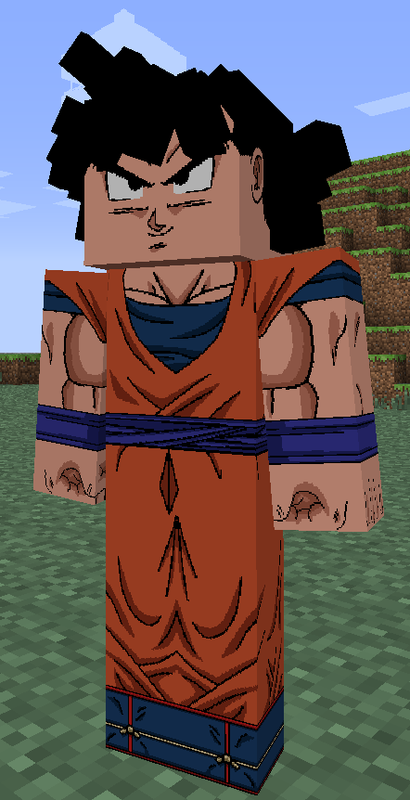 I’m going to redo it when I get around to doing the face textures again. For all the races. 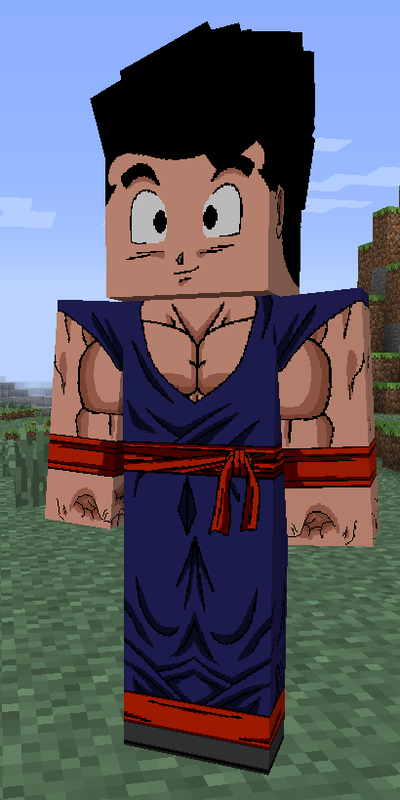 I’m going to change the eyes on Goten to the ones that Gohan NPC has above most likely. can you give us a link to download? I’m not sure, but I think the old download link is being updated while you guys ask for one. The thumbnail for it in the selection menu looks different anyways. could you make a feminine version of the Arcosians, and other body styles? Please ?! Sorry but no new updates. I have a few new things, but not many. Not enough for a whole new update version. I’ve been busy, and will get back to it eventually. I work on this only for a week or two at a time, and then stop for a while. I have currently stopped, but when I start again, I’ll be at it for a while most likely. It’s not a new update, I’m just re-posting the link. If it’s not working, then tell me and I’ll check it out. Have fun with the texture pack, and hopefully I’ll get around to adding some more soon. There is a lot left to do! If you have problems or suggestions, feel free to leave them here. When I get back into doing the texture pack I’ll look into it. If I do struggle to find time to work on this, then what do you guys want me to focus on and get done in the time I do have first? I assume it’s the Aracosian skins. Sometimes I get side-tracked and do a costume or two as well, but I’m assuming that its the Aracosian Skins. Tell me if that’s not the case. This reply was modified 1 year, 1 month ago by Diego. I have sketched female Aracosian designs, however I haven’t started making minecraft designs for them yet. They will be happening though. This honestly looks incredibly well made already. If anyone has any suggestions on female aracosian designs, feel free to tell me or link an image for me to see. If I think its good and doable, Ill think about putting it in. I’ve already done some sketches, but only of final/base forms. Please note that there are only 4 different layers to aracosians (Not including the face) so you can only use 4 different colors to show the different body parts. Female Human and Aracosian in progress, tell me what you think of these designs. (Aracosians will have another 2 female body types). I already know what I want to do for body type 2. 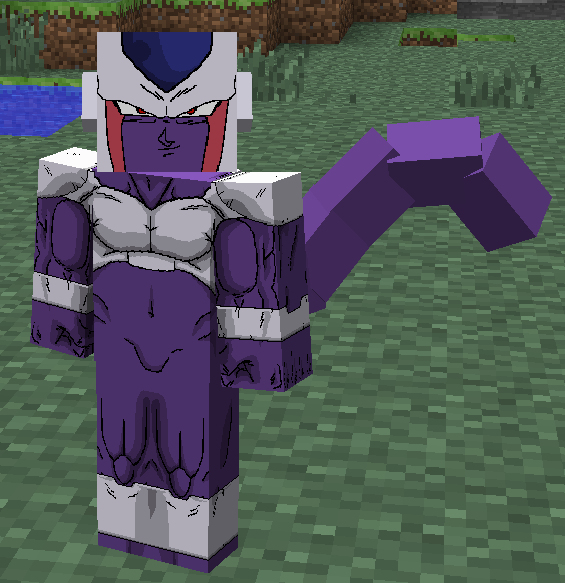 For body type 3 I’m thinking of just doing a female Freeza. Also, what do you prefer, buff female skins (Like SSJ Kale or Kefla)? Or what I have above (which I based off Caulifla)? Agreed. Saiyan’s my way, though. Female Human / Saiyan / Half-Saiyan Eyes. Tell me if you dislike any, or would prefer a different one than to what I have. Did you pay to have this Supporter? You my sir, are a god. I can’t wait for the next update! 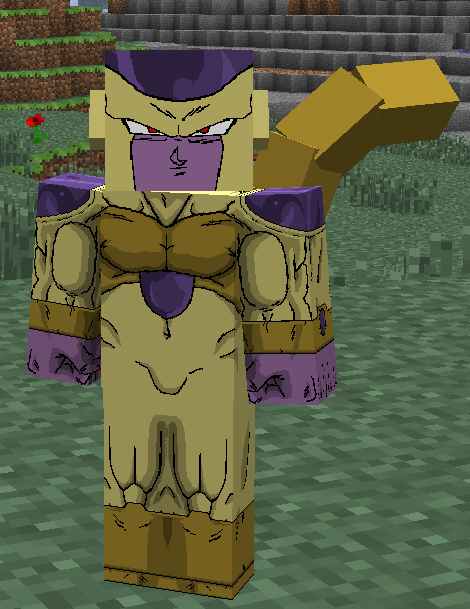 Would you guys prefer it if I just finished all of the final, fourth and golden forms, and leave the 1st 2nd and 3rd forms in the older v1.8 textures? Only temporarily of course. Yes, then can you release the download? Yes, I’ll release the download once I’ve finished all Final, 5th and Golden forms. The rest can be in the release after that. 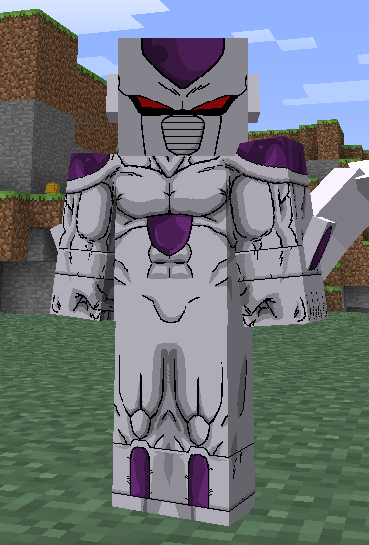 *ITS YA BOI COOLER-* No! No! None of that! 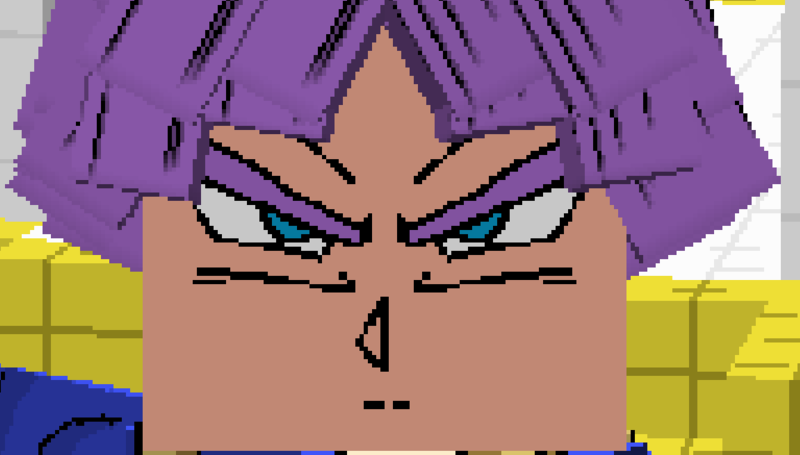 No more overused Dragon Ball Xenoverse memes. I made a green screen in Minecraft, and I wanted to test it. I think I’ll post images like this from now on. It’s not done! But its a start. You have to be a male human, half-Saiyan or Saiyan. It works best if you have white eyes and black hair, or white eyes and silver hair, with the lightest skin tone and while in your base form. 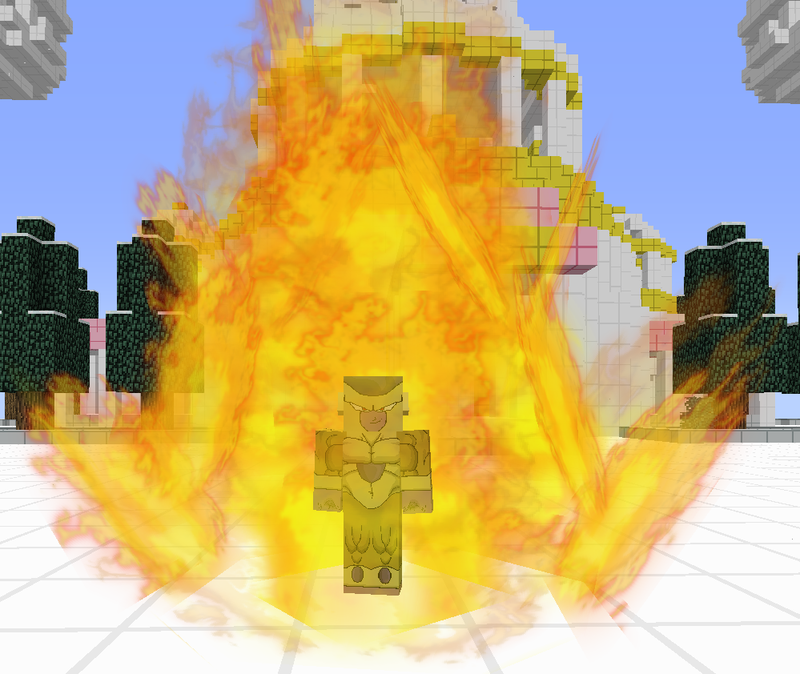 I’ll release the Texture pack once I’ve finished all Final, fifth and Golden forms. Click this to see my progress! 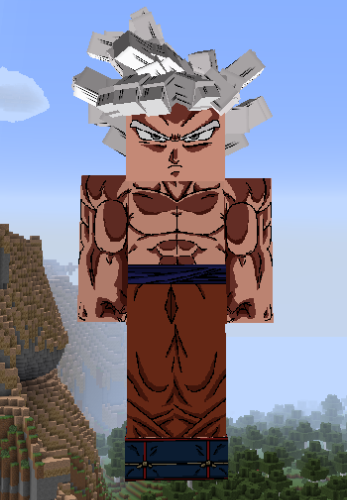 Click this to get the Ultra Instinct Texture Pack! I think Its Good Enough. 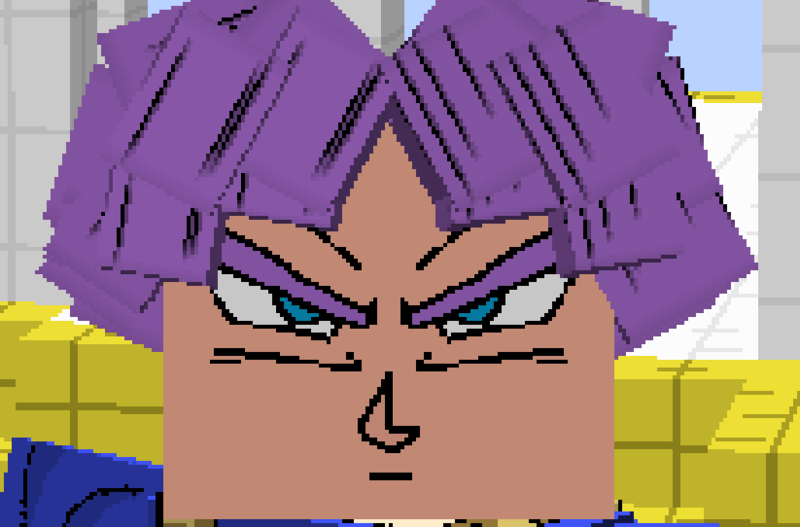 Ultra Instinct Texture Pack Update! Eyes will always be silver, no matter what transformation or normal eye color. Still only works for male Human, Saiayn and Half-Saiyans though. 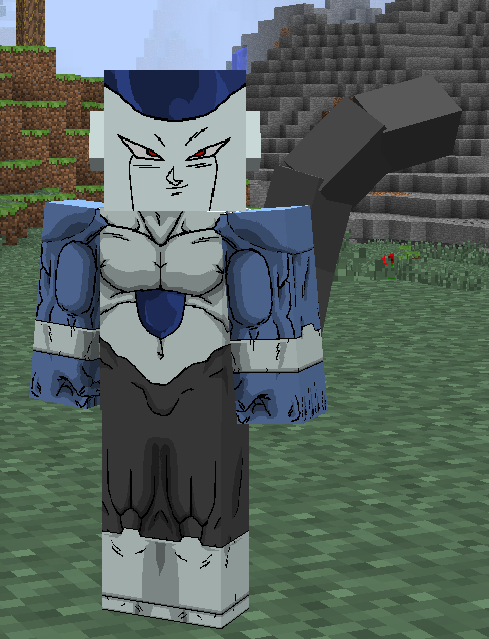 Click here to get Kasai Ultra Instinct Texture Pack v0.4! Good Kasai I like your texture, but have you made the new model of the new armor? No. No new armor textures have been done. I will, but arcosians first. I’ll start on it after Arcosians are done! 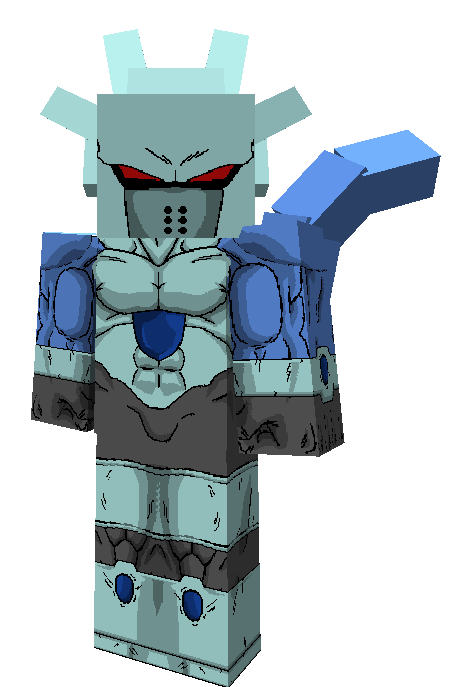 Arcosian Body Type 3, 5th form: View Texture! Female Arosian Body Type 3, Base form: View Texture! THE UPDATE IS HERE! CLICK THIS TO GO TO THE NEW TOPIC THREAD! 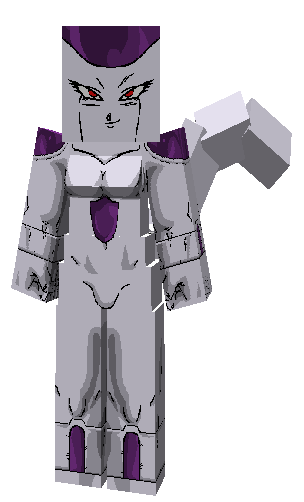 Hello Kasai, I came here to talk about a bug that happens to my friend when he puts the texture, well he installed the texture all right then he opens the Minecraft when it opens, it goes on the menu to choose its texture, however when it chooses and then clicks “Done” the game stops responding, and it crashes. (This also happens to me when I press Done, so my game crashes but I open it again and the texture is equipped.) But when he reopens the game, after it stops responding and crash the texture is not equipped, will you Do you have any idea how to solve this problem? 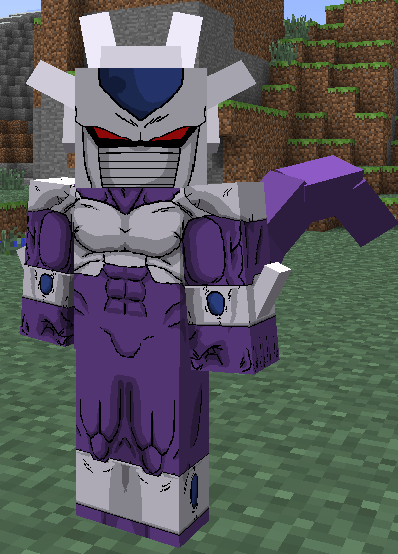 Out of everyone who uses my texture pack, none of them have had any problems like this. The biggest problem my texture pack has caused is just texture related. Sorry, but I have no idea how my texture pack could cause your game to crash. When I click ‘done’ it just takes a few seconds to load, and then its all good. Do you have another texture pack on? Or perhaps a mod is affecting it? I have no clue sorry. This reply was modified 4 months, 2 weeks ago by Dawson. Hey there! This is an older topic, there is a newer one now. But to answer your questions, gender should be an option where you select your skin tone, race etc. But it will only show up if you have Family C active. This link should take you to a page with a Family C mod download link. You will also need the JRM Core and JBRA Client if you don’t already. 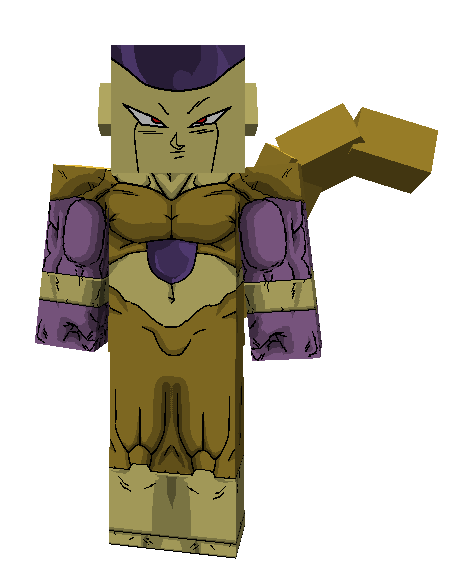 Now, for you second question, humans, saiyans and half-saiyans all only have one body type. I personally have created a workaround for this with some texture pack Add On’s. 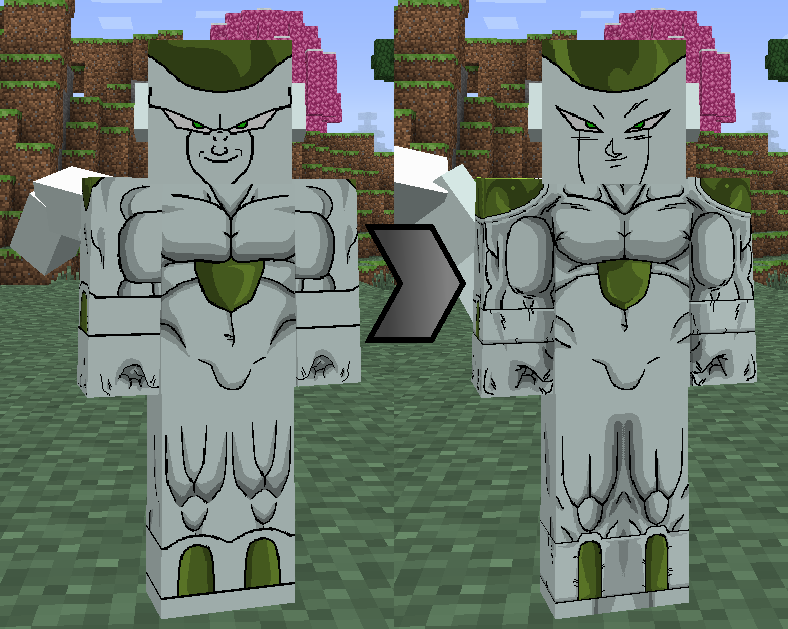 These add ons are not mods, they are just very small texture packs that change the default body type to a less muscular, or more muscular version. 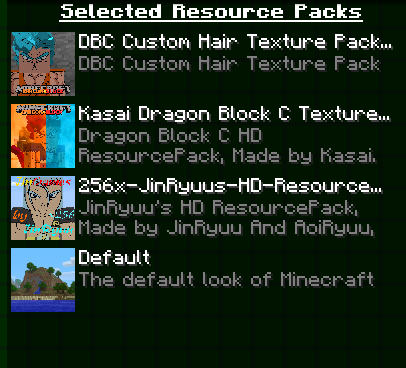 You use these add ons along with my regular texture pack, if you wish. For more info and the most up to date versions of my texture pack, you can join my discord to download them there, even if you just leave immediately after. Discord is just convenient for me. Hi! This is an old topic thread.